At least nine people who were elected as mayors of different Turkish provinces mostly from the ranks of the Kurdish Peoples’ Democratic Party (HDP), have been denied the mandate by the Supreme Election Board (YSK), the Mesopotamia news agency reported. Turkey’s Supreme Election Board (YSK) has recently announced that elected mayors would not be given mandate to govern if they were subjected to expulsion by decrees the government issued in the aftermath of a failed coup in 2016. 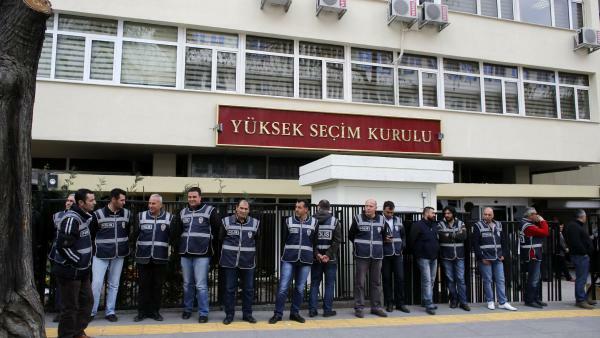 The YSK justified its decision based on a clause in the decrees which stipulates that dismissed civil servants can no longer be employed in public service. The board decided that the runners-up should be given the mandate instead. The AKP’s objections were lodged in the predominantly Kurdish East and Southeast where in recent years elected mayors from the HDP were replaced by trustees appointed by the AKP-led Interior Ministry.